Omid’s ICRA “International Conference on Robotics Automation” 2019 paper “Contactless Robotic Micromanipulation in Air Using a Magneto-acoustic System” is nominated for the Best Paper Award in Automation! Congrats Omid, and good luck presenting your work in Montreal in May! You can read a pdf pre-print of the paper here. This entry was posted in News on March 27, 2019 by microrobotics. 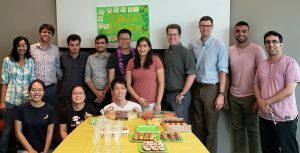 Congratulations to Dr. Jiachen Zhang, who successfully defended his PhD thesis today! Dr. Zhang is the first PhD graduate from the Microrobotics Lab. We had a celebration for him as he moves on from our group! This entry was posted in News on September 4, 2018 by microrobotics. Microrobotics Lab wins Second Place in event at Mobile Microrobotics Challenge! 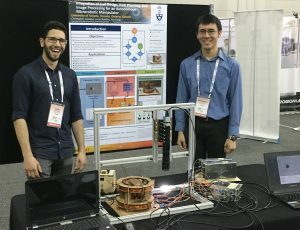 Our team of undergraduate students Christopher Lucasius (EngSci 4th year), York Dong (Mech 4th year) and Lucas Botelho (Mech 4th year) won second place in the “Autonomous Manipulation and Accuracy Challenge” event at the Mobile Microrobotics Challenge. The team competed in the even at the International Conference on Robotics and Automation (ICRA) 2018 in Brisbane Australia. This challenging series of tasks had the team design and manufacture microrobots up to 500 micrometers in length (about the size of a grain of salt) for both autonomous manipulation and microassembly in arenas less than 3 mm long. Thank you to the UofT Institute for Robotics and Mechatronics for helping support our team! 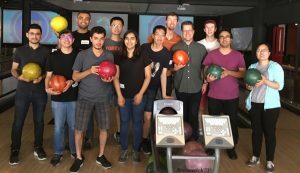 The team was supervised by Prof. Diller along with graduate students Jiachen Zhang and Mohammad Salehizadeh with support from Omid Youssefi and Tianqi Xu. This entry was posted in News on May 24, 2018 by microrobotics. This entry was posted in News on May 1, 2018 by microrobotics. Our research is highlighted in an NBCnews article on micro-robotics! This entry was posted in News on March 31, 2018 by microrobotics.